The Deco tool in Adobe Flash CS6 features 13 distinctive modes you can use to create interesting textures, patterns, and symmetrical drawings from symbols in your library or from preset patterns. Open or create a new Flash document and add at least two graphic symbols to your library. Select the Deco tool from the Tools panel. The Property inspector changes to reflect the current drawing effect, set to Vine Fill. 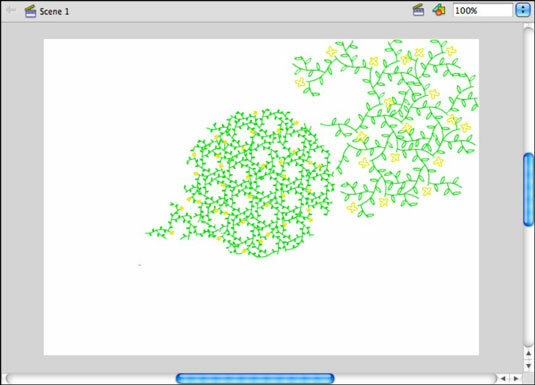 Vine Fill mode creates a vine-style pattern between two symbols, using one as the leaf (that decorates the vine path) and one as the flower (that appears at the end of each vine). In the Leaf section of the Property inspector, click the Edit button to select a symbol from your library to serve as the leaf. From the dialog box that appears, choose a symbol from your library and click OK to set that symbol. In the Flower section of the Property inspector, click the Edit button to select a symbol from your library to serve as the flower. From the dialog box that appears, select a symbol from your library and click OK to set that symbol. In the Advanced Options section of the Property inspector, click the color swatch and choose the vine color that will interconnect the two symbols you’ve chosen when the pattern is created. Click the New Layer button below the timeline to create a new, empty layer to paint on. Click the stage, and the Deco tool begins to draw a new vine pattern using the symbols you’ve chosen. The Deco tool draws a vine and caps the vine with the flower symbol you chose. Continue to click and release to draw new vines. Click the New Layer button below the timeline to create a new, empty layer to use with the Grid Fill. If the Deco tool isn’t active, select Deco tool from the Tools panel. Change the drawing effect from Vine Fill to Grid Fill by using the drop-down list at the top of the Property inspector. Grid Fill creates a uniform grid-style pattern within a selected area. You can use Grid Fill to fill either a specific shape on the stage or the entire stage itself. Click the Tile 1 Edit button to select a fill symbol. When the Select Symbol dialog box appears, choose a symbol from your library to use as a pattern and click OK. In the Property inspector, click and drag over the Horizontal Spacing and Vertical Spacing values to specify a distance in pixels between each row and column. (Optional) Use the Pattern Scale slider to reduce or increase the size of the symbol used to create the pattern. Click the stage with the Deco tool, and the stage fills up with a grid pattern using the symbol and settings you chose.